One of the important aspects of lawn maintenance is fertilisation. This process ensures the soil has enough nutrients for the lawn grass to succeed, including nitrogen, phosphorous, and potassium. Nitrogen is what helps the foliage stay healthy, phosphorous supports the roots of the plant, and potassium improves overall strength and resistance. You should use lawn fertilisers with 12-25% nitrogen, and smaller amounts of phosphorous and potassium. Fertilisation does not need to happen very often, but fertilising two or three times a year is recommended to keep your lawn healthy. There are many different fertilisers available — some made purely of organic material and others using more processes. Both types will provide the nutrients needed, but there are some pros and cons to each. “Organic” as it refers to fertiliser is not the same as organic as it refers to food. It simply means nutrients are minimally processed, and you’re getting more of the entire binding agent. So, you’ll be getting the composted manure instead of the extracted nutrients from it. Organic fertiliser is broken down by microorganisms that eat and process decaying plants and animal matter. Because these microorganisms need warmth, organic fertilising can be seasonally limited. Nutrient ratios are impossible to know for certain, and are often lower than in chemical fertilisers. 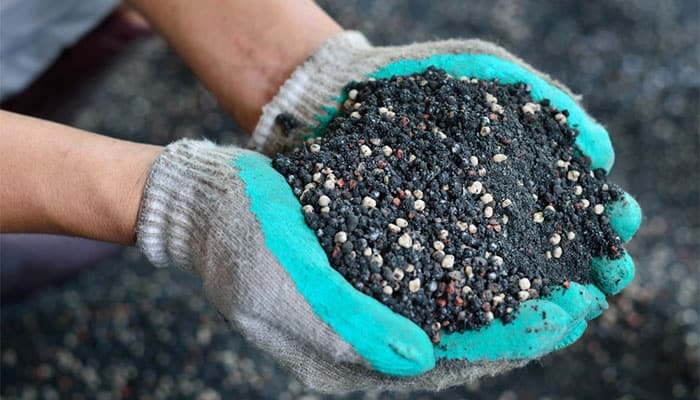 Chemical fertiliser (also known as inorganic, conventional, synthetic, or manufactured) is made by stripping down rocks, petroleum, or other minerals directly into nutrients. Both types of fertiliser will give your grass the nutrients it needs, but it’s up to you which type you prefer to use. Remember that a well-maintained lawn takes care and research. Do you have an opinion on natural vs chemical fertilisers? How have you got the best result for your garden? Let us know in the comments section.